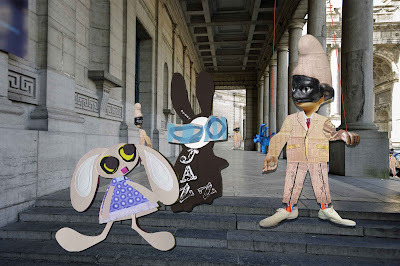 The Wabbit’s destination was the Big Parliament and as he and Lapinette hopped up the steps they met a puppet who fitted their mission target. "Follow my lead," whispered the Wabbit to Lapinette, "and if it doesn’t work, run some interference!" Lapinette nodded and the Wabbit stepped forward and addressed the Puppet. "I suppose you know how things operate around here?" asked the Wabbit. "Supposing I was to advise you?" said the Puppet. "Supposing I could make it worth your while?" said the Wabbit. "Supposing you were to demonstrate your goodwill," said the Puppet. The Wabbit paused, dug in his fur and jingled some coins. "I suppose that would do nicely," said the Puppet. The Wabbit leaned towards the Puppet and lowered his voice. "Supposing the Big Vote went a particular way," he continued. "Supposing I was to use my influence," said the Puppet. "Supposing I had 200 more of these coins," said the Wabbit. The Puppet pondered for a while. "I suppose every little helps," said the Puppet. "I suppose I could be more charitable," said the Wabbit and he jingled the coins in his fur again because he was beginning to like the sound. For a while they both listened and the Puppet smiled at the Wabbit and the Wabbit smiled back. "I suppose you’d have an opinion on how my friends might vote," said the Puppet and he rubbed a single coin in his hand as if it would magically multiply. The Wabbit shot a glance at Lapinette and she hopped quickly forward. "I suppose they might abstain," she murmured quietly.